Julie and Mike Fox, with Team USA golfers (from left) Jimmy Walker, Brooks Koepka, Rickie Fowler, and Phil Mickelson, at the 2016 Ryder Cup. 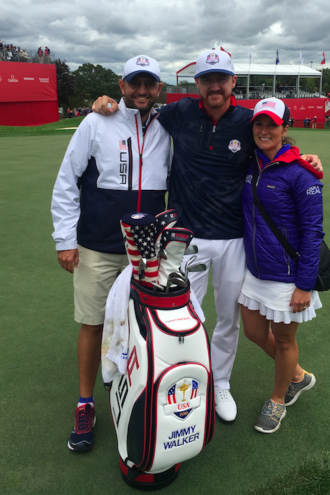 Snacks made by a Dallas entrepreneur are fueling Team USA this week at Hazeltine National Golf Club. When you see the world’s best golfers grabbing a snack between holes at the Ryder Cup this week, chances are they’ll be munching on granola made by Dallas entrepreneur Julie Fox. 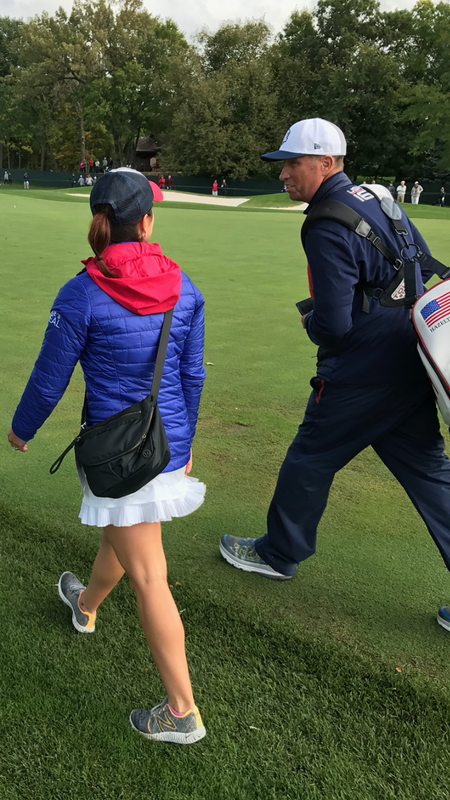 At the PGA’s request, Fox and her husband, Mike, hauled a carload of her cinnamon-vanilla bean and cacao-coconut treats up to Hazeltine National Golf Club, in Chaska, Minn., a suburb of Minneapolis, to stock the Team USA locker rooms, family room, team room, and hotel. It has been a dream come true for the Foxes, who are big-time golf fans. “When you find out all these guys you’re a fan of are fans of what you do, it’s the coolest thing,” Julie says. 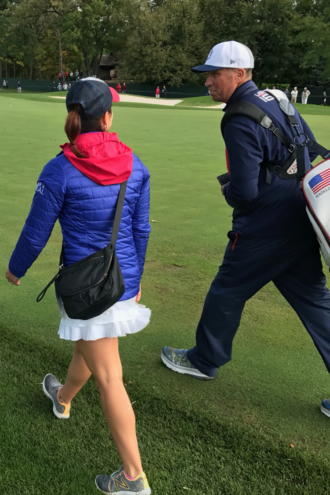 Julie Fox walking the course with Phil Mickelson’s caddy, Jim “Bones” Mackay. For those who don’t know, the Ryder Cup is a golf tournament between 12-man teams from the U.S. and Europe. It’s held every two years, alternating between American and European courses. The 2016 tournament kicks off tomorrow at Hazeltine with more than 250,000 people expected to attend. They had a hard time finding snacks that fit the “caveman” eating plan. “When you start looking at labels and analyzing what’s in a lot of things on the store shelves, there’s really not a lot of ‘clean’ food — especially snacks,” Mike says. 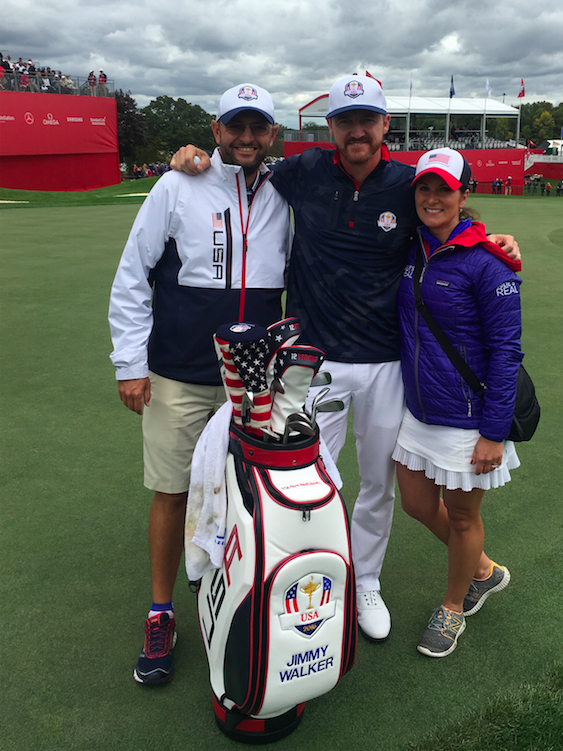 Julie Fox with pro golfer Jimmy Walker (center) and his caddy Andy Sanders. Julie didn’t want her husband to feel like he was on a diet for the rest of his life, so she began making nut butters and grain-free granolas at home. Mike encouraged her to try to start selling the snacks. She began packaging them and came up with the Julie’s Real brand. When the PGA asked the Team USA players what they wanted to eat during the week of the Ryder Cup, so many of the guys requested Julie’s Real products that the PGA got in touch with Fox and asked her to stock the facilities. Closer to home, Julie’s Real products are available at Royal Blue Grocery at Highland Park Village and other specialty shops, juice bars, and coffee shops. They’re also available at the Four Seasons in Las Colinas and at Grayhawk Golf Club in Scottsdale, Arizona. And they’re sold online. The granolas go for $4.95 a pack and are also available by the case. The nut butters (four flavors) sell for $14 to $15.75 a jar. They’ll soon be available at local Whole Foods stores. Julie makes the products out of a commercial facility in Dallas. With demand taking off, she’s scaling up production and recently left her job as a speech pathologist to concentrate on Julie’s Real full time.